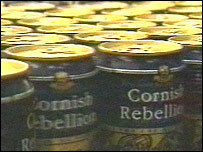 Staff at a Cornish brewery are waiting to see if an investor can be found to save the business. Five people were made redundant when Redruth Brewery was put into administration this week. The brewery employs 26 workers, carrying out contract bottling and canning. It also brews specialists beers. The administrators were called in after the firm encountered financial difficulties. One of the insolvency specialists from Begbies Taylor sent into the brewery, Ian Walker, said he hoped the company could be made viable. "I am not interested in just selling it on to another owner. "I want to try and make it viable and I am very positive about it at the moment." But James Staughton, the managing director of St Austell Brewery, said he doubted the Redruth company had a viable future. "It seems unlikely, though I would love it to be the case as that would be good for the county and the brewery industry. "There have been failed attempts previously, and I am just not sure who would be interested," he said. Founded in 1742, the brewery, owned by a Hong Kong-based company, is one of the oldest in Britain. The Camborne-Pool-Redruth Regeneration Company said that, if a investor could not be found, the brewery's site had considerable potential. Company chief executive John Dobson said the area would be suitable for mixed development, including affordable housing. "We are not just talking about the rented side of affordable housing, but actually homes that normal people can go in and buy for a reasonable price. "We think there is scope to get some sort of business activity in there - possibly some office accommodation converting some of the existing buildings. "There could also be some good quality public open space close to the town centre."